Boston developers and policymakers are desperate for more affordable housing tools in the city, but the biggest help may hinge on lawmakers in Washington, D.C.
A leading tool in Boston’s affordable housing toolkit, the Inclusionary Development Policy, led to the creation of 546 new units of affordable housing in 2018, or 21% of the program’s overall production since it was implemented in 2000. While Boston Mayor Martin Walsh was pleased by the news, he and members of the private and public sector speaking Tuesday at Bisnow’s Boston Affordable Housing Conference agreed changes in policy and development practices are crucial in moving Boston’s affordability needle. “We have members of Congress coming out of the woodwork with affordable housing legislation,” Housing Advisory Group Executive Director David Gasson said. Gasson and Boston Capital President and CEO Jack Manning are working on reforming the Low-Income Housing Tax Credit (to be renamed the Affordable Housing Tax Credit if the new legislation is passed). The LIHTC offers 9% and 4% tax credits for affordable housing projects, with the higher rate typically reserved for new construction and the lower rate for rehabilitation or new construction projects financed with tax-exempt bonds. The problem is the credits have often fallen short of the 4% and 9% figure and fluctuated due to market interest and borrowing rates of the federal government, according to a February report by the Congressional Research Service. One goal of the bill, expected to be introduced by U.S. Sen. Maria Cantwell (D-WA), would freeze the 4% rate at its actual level. Doing that alone would, at a conservative estimate, create 65,000 more affordable units. Low-Income Housing Tax Credits generated in each state are based on population. Originally, the rate was $2.40 per capita. Congress has since provided a 12.5% increase through 2021, and there is a potential for the rate to increase by 50% in the new bill. But Gasson indicated the 4% fix is the top priority. “This is a gigantic change for our industry and the people that need affordable housing,” Manning said. Both Manning and Gasson claim to have bipartisan support in both federal legislative chambers. Along with Cantwell, Sen. Todd Young (R-IN), Sen. Johnny Isakkson (R-GA) and Sen. Ron Wyden (D-OR) are supportive of the bill, according to Manning. Speaker of the House Nancy Pelosi (D-CA 12th), Rep. Richard Neal (D-MA 2nd) and Rep. Kenny Merchant (R-TX 24th) have also supported the bill. More are expected to join. “There are Republicans clamoring to jump onto the bill, and it hasn’t even been introduced yet,” Gasson said with a laugh. Beyond federal policy, panelists indicated Boston leaders and developers are doing more at the local level to rein in costs. Walsh indicated his proposed 2020 city budget includes a historically high level of city funding for the creation and preservation of affordable housing in Boston. After citing a long list of economic accomplishments under his watch, Walsh said there were plenty of initiatives in the works to tackle affordable housing, including an increase in the affordable housing requirement for market-rate developers in the IDP. “I’m painting a rosy picture here, but there’s still a lot of work we need to do to continue to move forward,” Walsh said. Forward thinking in the planning and development stages is also crucial to making affordable housing a realistic goal in Boston. 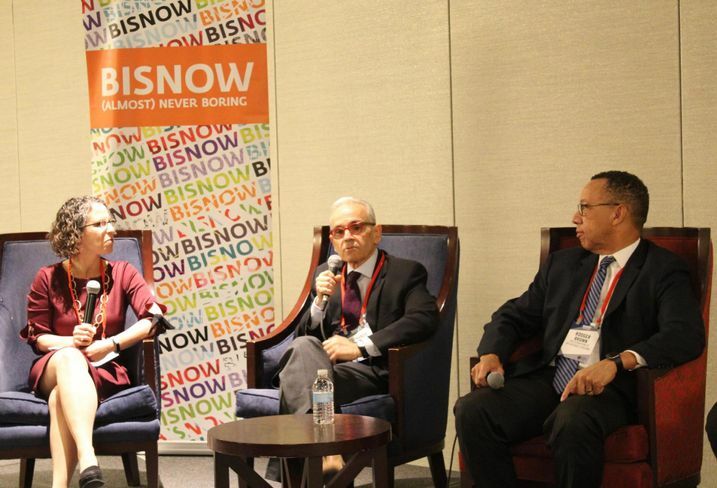 Construction costs have gotten so high that Preservation of Affordable Housing Managing Director for Real Estate Development Rodger Brown said his team has looked overseas for building technologies to move a project forward. Instead of stick-frame construction, the developer utilizes modular and panelized materials. Others are looking for ways to streamline the approval process because it is easy for a project to go over budget simply due to the quick timeline of building costs rising. It can cost a developer around $450K to build a single residential unit in Boston today, and Dellbrook JKS President and CEO Mike Fish said building costs are rising at an average of 5% each year.